Last week Vanderbilt University hosted a group of architects and architecture faculty from the University of Melbourne for a series of presentations and conversations on the design of learning spaces. Melbourne is one of our “sister” schools, and faculty from its School of Architecture have been collaborating in recent years with faculty from our College of Education and Human Development to explore the intersection of education and architecture. 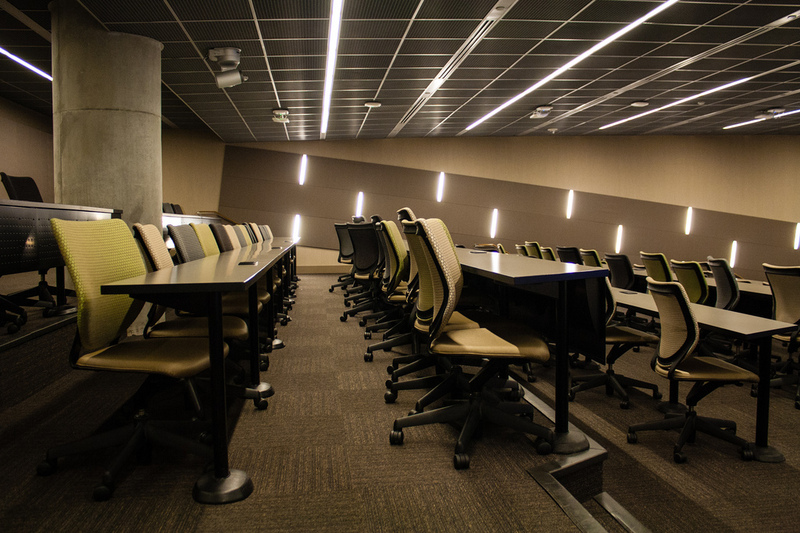 Since I’m interested in the design of learning spaces, particularly classrooms, and since I want to see more learning spaces at Vanderbilt that support teaching and learning well, I was an enthusiastic participant in this series of events. One of my takeaways from the series came from guest Richard Leonard, an architect with Hayball Architects, whose presentation, like all the Melbourne presentations, focused primarily on K12 learning spaces. 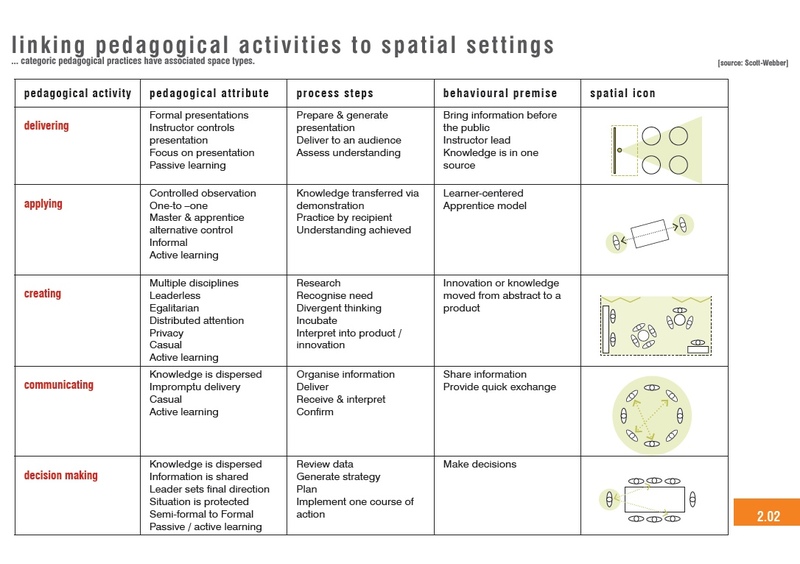 He shared an image or two from Linking Pedagogy and Space, a report from fellow architect Kenn Fisher, arguing that different kinds of learning activities benefit from different kind of learning spaces. Most colleges and universities don’t implement this principle in the fine-grain ways that Leonard described. 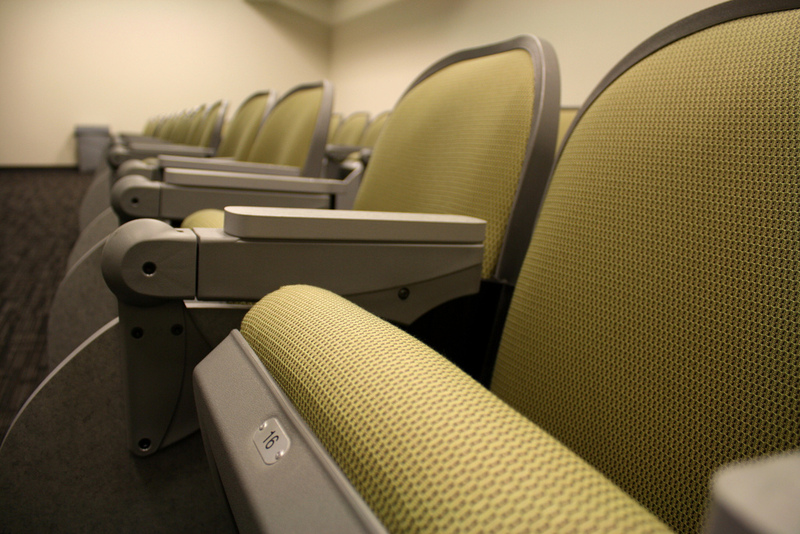 Yes, we have lecture halls and seminar rooms and labs and informal study spaces, but typically a course is assigned to one and only one space for all of its class sessions. 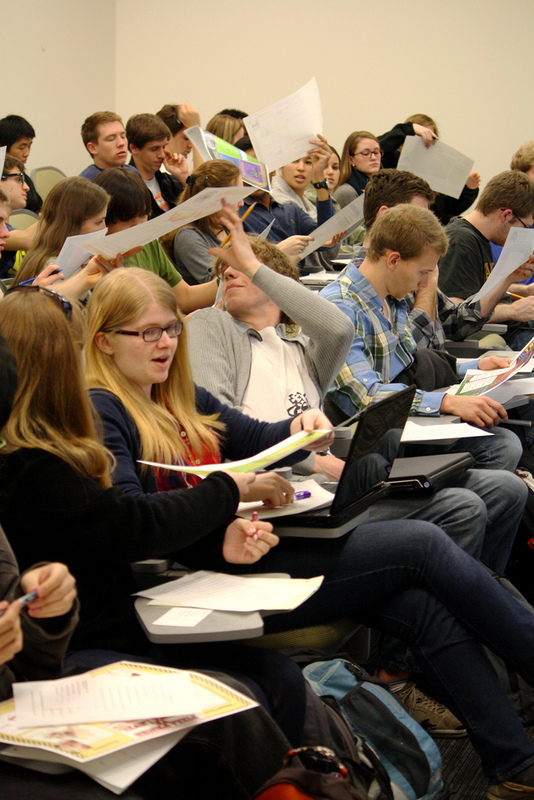 We don’t provide faculty with the ability to move to difference spaces for different course activities. This fall, I taught my linear algebra class in Stevenson Center 1207. That’s where we met each Tuesday and Thursday–with one exception. I broke the “stay in your classroom” rule on the last day of class, when I moved us to the workshop space at the Center for Teaching for our end-of-semester poster session. But such movement isn’t common. Movable furniture counts for a lot, particularly when the chairs have wheels! It’s a lecture hall in the Clough Undergraduate Learning Commons at Georgia Tech. The designers of this classroom made one small choice that greatly increases the flexibility of the space. Note that each tier has not one, but two rows of tables and chairs. This makes small group work easier, since students on the front row of a given tier can turn around and join students on the back row. 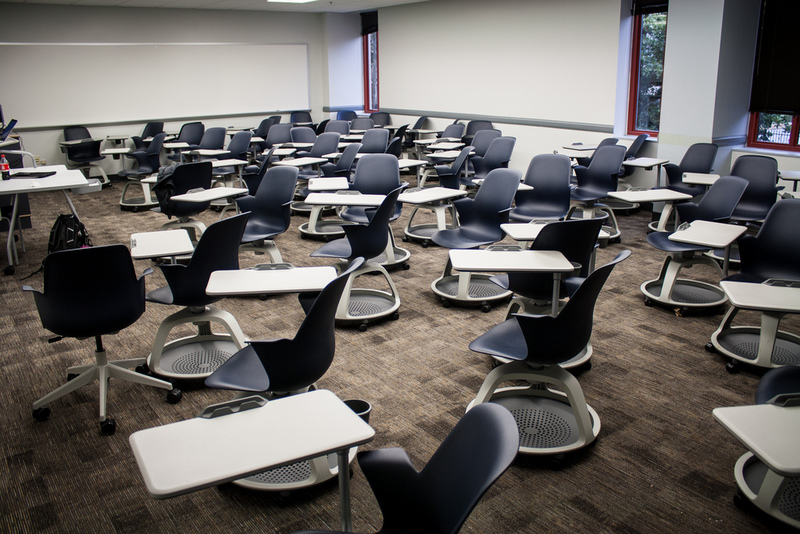 This design doesn’t sacrifice any seating capacity and I can’t imagine it’s much more expensive than the usual one-row-per-tier, but it makes the learning space much more flexible. 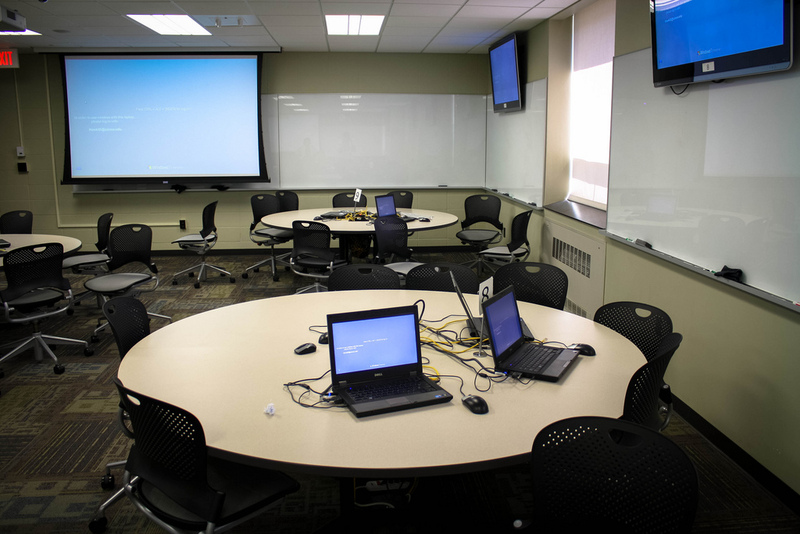 It’s a TILE (Transform, Interact, Learn, Engage) classroom at the University of Iowa. With tables for eight, wheels with chairs, and the ability to throw student laptop displays to any of the big projector screens around the room, it’s fantastic for a project- or team-based learning experience. But do you see all those cords in the middle of the table? I’ve been told that the newer TILE rooms do a better job of cord management, but at least in this room, it’s impossible to move those tables. If an instructor wants to transition out of a small group configuration for a time, it’s a bit challenging. That said, this room is far more flexible than the fixed seat classroom I’ve been in this fall. I’ve seen other classrooms like the TILE room with a different challenge: There’s no point in the room with sight lines to every student. I understand the value of decentering the classroom, shifting the focus from instructor presentation to student activity, but even in the most student-centered courses there are times when it’s valuable for the instructor to have all the students’ attention. 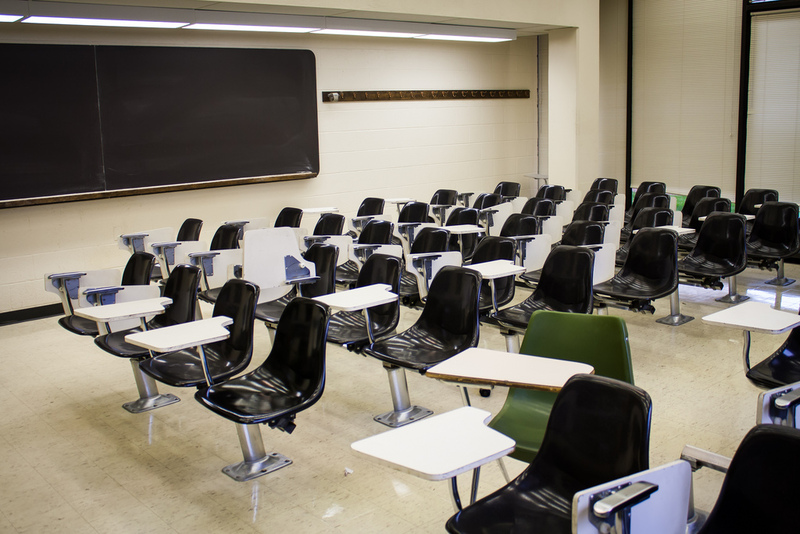 Perhaps readers of this blog who have experience with such decentered rooms can weigh in on how well these rooms support, say, a mini-lecture at the end of class intended to draw out key points from the students’ group work. The classroom was designed to encourage students and teachers to move around the room, using different spaces in the room for different kinds of learning activities. In the study, the movements of a teacher and a couple of students were tracked. 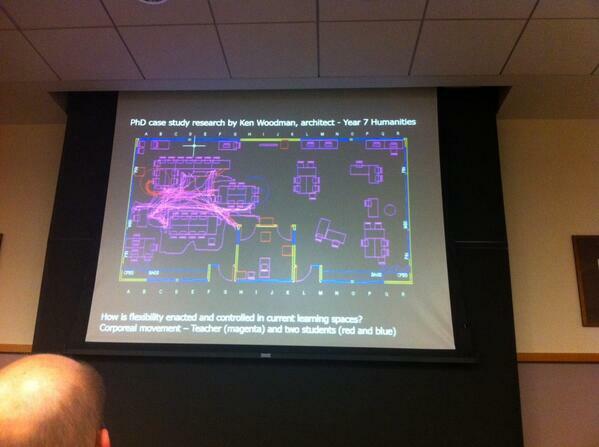 In the visualization above, pink lines represents the location of the teacher, who moved all over one side of the room. The red and blue lines represent the two students, one of which moved a little and the other not at all! This study led me to reflect on the limitations of using photos of learning spaces as a way to understand how those spaces are used. I’ve taken many photos of empty learning spaces, that is, spaces without students and teachers, like the ones I’ve shared here. We have to be careful to remember that the uses of learning spaces we imagine when we see those photos might not be ways that students and teachers actually use those spaces. There’s good evidence that the design of a classroom will influence how teachers and students behave in that space, but it’s not a guarantee. That’s why it’s important to involve faculty in the design of their classrooms (as Richard Leonard pointed out in his remarks) and to provide them with ongoing support and training as they use these spaces. Holding a traditional poster session in that space would have been impossible, and I had too many students to fit in the Center for Teaching workshop space. So I organized a seated poster session. The students remained in their seats and printouts of their posters moved around the room. Fixed rows of seats certainly limit the kinds of learning activities one can organize in a classroom, but, at least in this case, I was able to work around those limitation! More information on the seated poster session can be found here. Thanks to Peabody College’s Space, Learning, and Mobility Lab (SLaMLab), Peabody International Affairs, and the Vanderbilt International Office for sponsoring and hosting this fascinating series! One Response to "Flexible Classrooms: Highlights from #Spaces4Learning"